A Brand new MADE IN ENGLAND collection is here! The Dr Martens ‘Made in England’ range is created at the Cobbs Lane Factory in Wollaston, England; which has been producing footwear since 1901. It is the home of the original Dr Martens boot and within these factory walls works a specialised team of cutters, clickers and welters schooled in traditional shoe making methods and the unique process that makes Dr Martens like no other shoe on earth. Here, in amongst the smell of freshly cut leather and the noisy backdrop of carefully preserved machinery, the unmistakable shape of Dr Martens boot begins to form: traveling the length of the factory floor beginning with a small pile of tanned leather hides, the process takes the boot through various highly skilled stages of evolution until its final arrival in the box. Why made in England? In 2003, in a last ditch effort to stave off bankruptcy, Dr Martens closed all but one of it’s UK factories. It kept this one small factory open, hoping one day that it could manufacture small runs, one-offs or customised boots and shoes for those prepared to pay the extra cost of making in England. This one remaining factory was just not any old factory, It was the factory in Wollaston where the very first 1460 boot was made on April 1st 1960. Many of the skilled cobblers who have worked at Wollaston remember the early days of Dr Martens production; the names of the suppliers of leather, components and the origins of the swing tags and boxes. Above all they remember why Dr Martens was made like no other boot on earth. they knew the care, attention and skill needed in the unique heat sealing process that welds by fire the air cushioned sole to the upper. In the last few years, this small factory has expanded in size to make 70,000 pairs a year. This is not even 2% of the global Dr Martens output , but, sure enough there are customers all over the world who want to wear a product that is made on the original site. With the expansion come the possibility of recruiting and training more workers, young and old, to keep shoe making skills in general and Dr Martens know how in particular alive in Northamptonshire. It also means that materials and components will be sourced locally if possible. 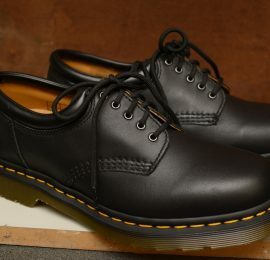 But, on top of all this, Dr Martens are also able to send its cobblers and technicians from Wollaston to Asia to help train the workers there and to make sure that Dr Martens unique process and quality are replicated everywhere that it’s boots and shoes are made. *Note to all good people reading this… While we aren’t rich enough to open shops in every town and state, we do LOVE to post Dr Martens things to you. If you like this thing and you want it in your life, add it to your cart and we will have them specially delivered to your door. When you order with us, we check the actual stock style. We open the box to ensure that the shoes are perfect and no surface scratches or inconsistencies wrong sizes appear etc… It happens! We personally and carefully check that your new docs are 100% perfect, because quality and service are MOST important to us. If you have ANY questions about our styles, or have any confusion over sizing, let us know. If you are looking for something you cannot see, get in touch with us! We’d love to chat on the phone or send us an email using our contact page.